In this week’s Wall Street Journal “Sightings” column, I report on “Callas in Concert: The Hologram Tour,” which I saw last week in Connecticut. Here’s an excerpt. Maria Callas gave a concert last week at the University of Connecticut in Storrs. That’s what the sign outside the hall said, anyway, even though the greatest operatic soprano of the 20th century has been dead since 1977. Nevertheless, she’s currently touring Europe, the U.S. and South America, with stops in more than a dozen additional cities between now and March, and if the turnout in Storrs was any indication, plenty of people are going to buy tickets. Yes, Callas is definitely dead, and no, that wasn’t her on stage at the Jorgensen Center for the Performing Arts, singing arias by Bellini, Bizet, Gounod, Ponchielli, Puccini and Verdi (including the popular “Habañera” from “Carmen”) with a 60-piece orchestra conducted by Eímear Noone. Nevertheless, “Callas in Concert” really happened, and those who saw it got their first taste of a technology that has the potential to revolutionize the concert business. The “Callas Hologram Tour,” as it’s subtitled, is produced by BASE Hologram, an entertainment company that has also sent the late Roy Orbison “on tour” and is planning to do the same with Amy Winehouse next year. 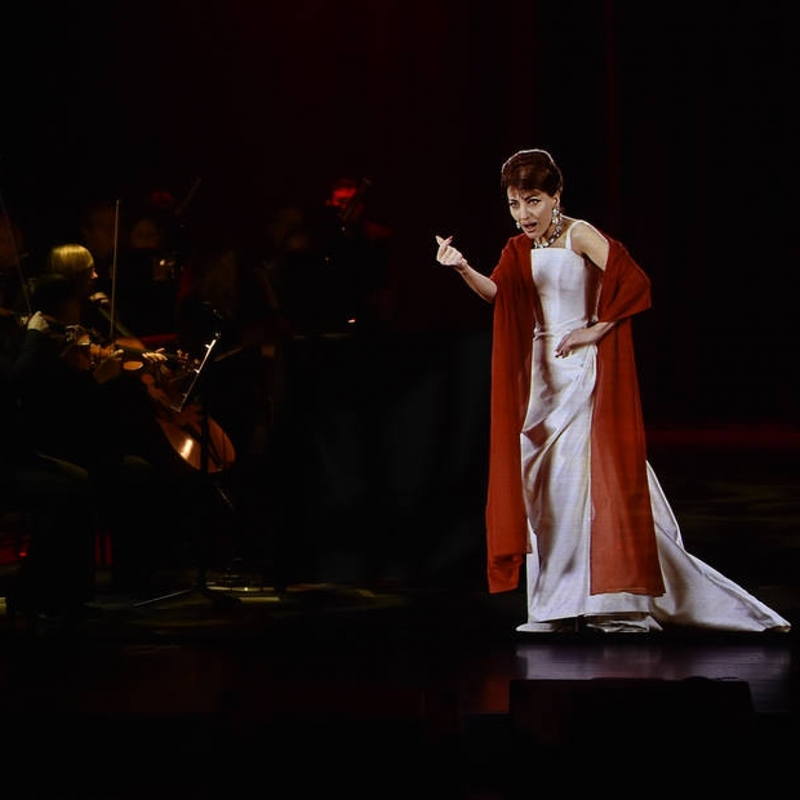 Using a modernized version of a 19th-century “magic” technique called Pepper’s Ghost, a video of Callas is projected onto a transparent screen in such a way as to make it appear that she is standing at center stage, flanked by two groups of orchestral musicians. While her full-color image is not in fact a real hologram, it closely resembles one. The 3-D “Callas” is translucent: You can see the orchestra players through her white gown as she walks past them. Otherwise, she looks startlingly, even disorientingly like a living person lit by a tightly focused pinspot….